I encourage our teaching and learning community of faculty and student scholars to talk about what is happening in our nation and world. I urge us to engage each other and talk about ways in which we as individuals, and as a very special community, can come together around these events to contemplate action and change. 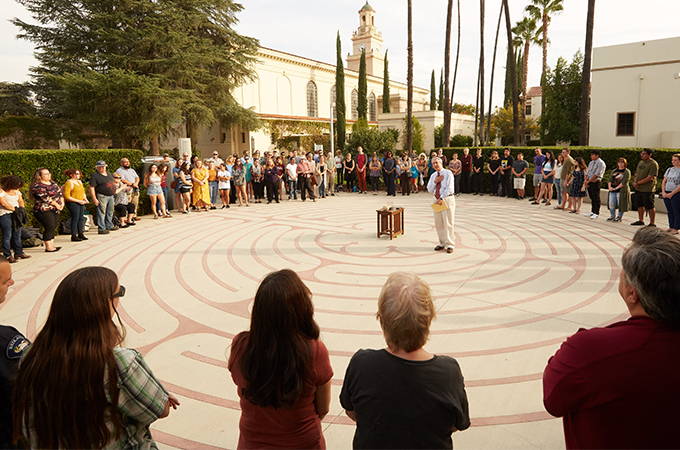 Chaplain John Walsh has called for us to do just that—to come together as a community at the Labyrinth at Memorial Chapel [October 29] at 4:00 p.m. as our weekly gathering for “Monday Prayers for Peace.” We light the peace candle at 4:05. I hope to see many of you there. Hillel is planning their meeting [October 30] to be open to everyone who is going through our sense of communal stress related to the current events. The local synagogue’s Rabbi, Lindy Reznick, will be at the meeting to talk about what has happened. And, as always, I encourage you to seek support if feelings become a burden that requires extra help to relieve. Counselors can be reached 24/7 by calling 909-748-8960, or you may make an appointment at the Counseling Center on the Redlands campus by calling 909-748-8108; the Center is open 8:00 a.m.–5:00 p.m., Monday through Friday. In honor of the dead, and as proclaimed by the White House, the flag is to be flown at half-mast from October 27 through 31.